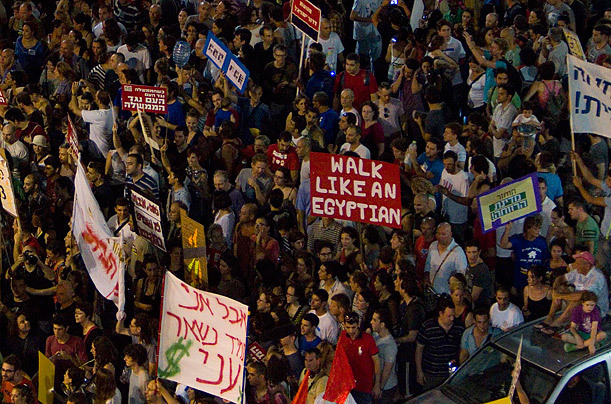 TEL AVIV  No slogan embodies the momentum of the Arab Spring like the one pictured here, used during an August protest against the cost of living: "Walk like an Egyptian" reads the red-and-white placard toward the bottom right. Though the Arab Spring  the pro-democracy revolutions in the Middle East  started in Tunisia, the world gave its full attention once Egyptians massed in Tahrir Square. Their success then became inspiration for other protesters from Syria to Yemen to those "occupying" cities around the world.